Corinne Reilly is a writer in Pact's communication department. Even before Nepal’s 2015 earthquakes, Kamala Masakoti struggled to get the water her family needed. She had to haul it from a natural source near her home in a rural village tucked into a terraced mountainside in Nepal’s Lamjung district, in the shadow of the Himalayas. Then came the quakes, and Masakoti’s water source disappeared. The next nearest one — more than an hour’s walk away — was soon being shared by hundreds. Masakoti’s garden suffered. Washing clothes and bathing became nearly impossible. Her children often missed school because they were helping fetch water. “It was a very difficult situation,” she recalls. Fast forward to today and Masakoti has a tap in her own front yard. It’s one of a dozen that connect to a gravity-fed, earthquake-resistant drinking water system that includes a concrete tank and 9,300 feet of underground piping. Masakoti says the system has changed everything for her village. Masakoti’s neighbors gather at their new water system’s tank. And because the water system was built using a unique Pact model — one that puts communities in charge of their own recovery after a disaster — those benefits were just the beginning. After the earthquakes, which struck in April and May 2015, Pact sought to expand parts of Sajhedari Bikaas to five hard-hit districts. USAID funded Pact’s proposal, and that fall, Pact began working with communities to select small infrastructure projects — up to $10,000 — that would aid in their recovery. Rather than hiring contractors to carry them out, though, Pact is using Sajhedari’s model, giving communities the chance to implement and oversee the projects themselves. Two years after Nepal’s earthquakes, which killed nearly 9,000 people, rebuilding continues. The model works like this. Once a project is selected, through a locally driven process prescribed by government guidelines, Pact helps the community choose from its ranks what is known as an Implementing Partner Committee, or IPC, to lead the project. Also called for under Nepali guidelines, IPCs usually include 11 people. Pact requires that more than half be women, and members of marginalized castes must also be included. Communities also choose a Project Monitoring Committee, or PMC, to oversee the work of the IPC. Villagers in Kalinchowk, in Dolakha district, gather to decide who will serve on the IPC for a drinking water system they are about to begin building. Next, IPC and PMC members receive two days of intensive training on both the administrative and technical aspects of implementing their project – from keeping records and managing a budget to procuring materials, hiring laborers, following plans, and ensuring quality construction and accountability. IPC and PMC members in Lapilang gather for training at the start of a project. Communities that receive Pact’s support must also come up with sustainability plans to pay for repairs and maintenance. Community members in Babare, in Dolakha district, take part in a public audit for a Pact-supported crop irrigation system they just completed. So far, Pact has used the model to help communities in Lamjung, Gorkha, Dhading, Dolakha and Ramechhap complete 50 infrastructure projects, with 140 more underway. Besides drinking water systems, they’ve included community centers, crop irrigation projects, road improvements and micro-hydro power systems, along with micro-hydro power line repairs. And then there are the psychological benefits. Community members dig ditches for burying piping for a Pact-supported drinking water system. They spend hours each day fetching water. The new system will deliver water almost directly to their doors. That was true for Masakoti, who, in addition to benefitting from the Lamjung drinking water system, served as treasurer of the project’s IPC, overseeing its budget. As a Dalit, or “untouchable,” Nepal’s most marginalized caste, she says taking on the role changed the way some in the community saw her. Kamala Panday, 60, a Brahmin who was a member of the project’s PMC, says putting women and marginalized castes in leadership roles left a lasting difference. Besides their time, Panday and her neighbors contributed the land where their system’s tank sits, as well as 190,000 Nepalese Rupees — about $1,800 — to add extra taps. The work took about six months and finished in January. Across all of the earthquake recovery infrastructure projects that Pact has supported, 59 percent of IPC members have been women, and many served as committee chairs. 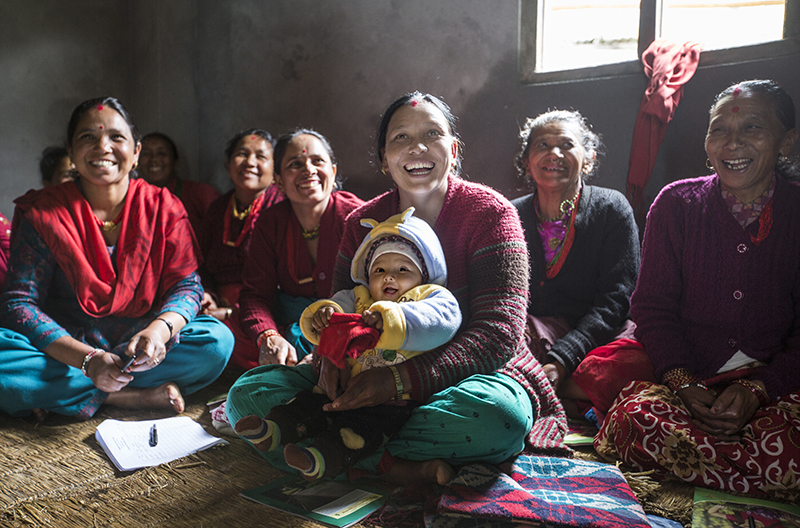 While Nepal now requires that women be included in development, it is something many people here are still adjusting to, says Kiran Ghising, a Nepali Pact field coordinator. The same goes for other historically marginalized groups, says Katz. The audits are setting an important example of transparency, too — both for citizens, who are learning to demand greater accountability, and for public officials, including local politicians who are now being elected in Nepal for the first time in decades. One such official, Bin Kumar Thami, who was elected mayor of a rural municipality in Dolakha in May, recently attended a public audit for a Pact-supported drinking water project. He says he was so impressed with what he saw that he plans to insist on inclusivity and transparency in all future public development projects in his town. Women in Gorkha district use a recently completed Pact-supported water system. Meg Nalbo, deputy director of USAID Nepal’s Democracy and Governance Office, went a step further, saying Sajhedari Bikaas is proving useful for achieving inclusive development beyond the project’s working areas. “We’ve institutionalized a lot of elements of the model within our other development projects,” Nalbo says. Photos and video by Brian J. Clark for Pact.